The Norma Jean by Arrow sells in the $850-$900 range with the optional Quilt Leaf that can be purchased separately. 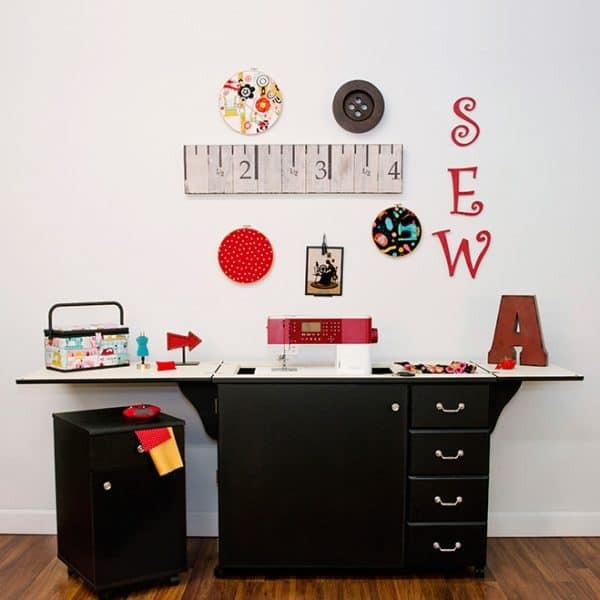 It’s very similar to the Arrow Sewnatra, but includes four drawers and an accessory tray for storage. It comes in four finishes: Oak, Cherry, White, or Black. The airlift mechanism simplifies raising and lowering the machine which allows for easy storage. Along with the optional Quilt Leaf, you can get a custom machine-specific acrylic insert from Arrow. This cabinet allows for a very nice sewing experience. I consider it an upgrade for someone who loves to sew and needs more space, but still wants the option to hide away the machine. Large Surface Area With Compartments: When the leaves are in the open position, the table top features a vast expanse of surface area to either side of your chair. (The leaves rest on sturdy supports, so you don’t need to fear that they will bow and crack the second you put anything heavier than a spool of thread on top.) The opened leaves reveal not only functional surface area, but also recessed compartments for keeping tools and materials handy. Flexibility: When you’re done using your machine, simply push down to lower it all the way into the cabinet . Then, fold up the leaves, close the door, and voila: You’ve got a small, tidy cabinet that conceals your machine and supplies. It can also easily roll out of the way until you need it next.